1. On the IGEL Thin Client desktop, double click on the Oscar VNC icon to open the Oscar VNC Client. 2. 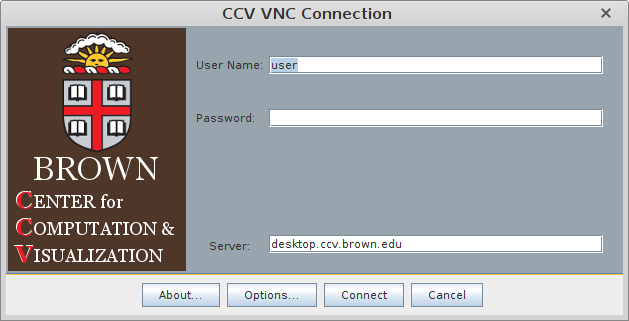 When the login screen opens, enter your CCV username and password and click Connect. 3. 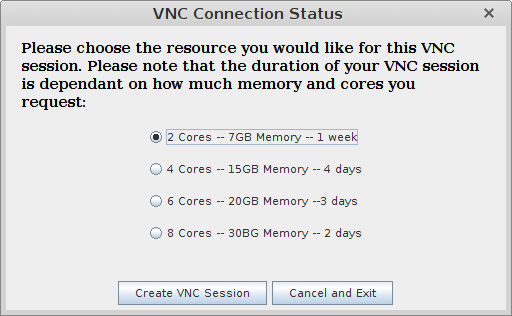 A second popup window will then open asking you to select parameters for your VNC session. Select the best option for the work you plan to do. Choosing more cores and RAM will give you more computational resources but reduce the maximum session time. Once you have selected the option you prefer, click Create VNC Session. 4. The cluster will submit your VNC session into the queue. You'll see a window similar to the screenshot below. It usually only takes a minute or two for the queue to process and the desktop to launch. 5. Once the session has been created, the VNC desktop will launch (as seen below). You can then utilize the session just like a normal desktop. 6. When finished with your VNC session, click the green EXIT button on the top left. You will have the option to either suspend your VNC session or kill it completely. If you plan to reconnect and resume work in a short period of time, use the disconnect option to suspend your session. If not, you can kill the session. If you choose to suspend your session, please keep in mind that it will only persist as long as the original session length.